1. Absorb as much of the urine with paper towels. 2. Empty a regular drinking glass full of water over the accident spot. 3. Blot this diluted liquid until the paper towels show no signs of yellow. 4. Scrub the spot with a brush and carpet cleaner. 5. Again spray the spot with carpet cleaner and follow the cleaner's instructions for removing with a vacuum cleaner. Repeat as necessary. 6. Spray an odor eliminator (available in most local pet stores) over the spot. Follow the directions explicitly, to avoid any lingering odors. Here's how to clean dog urine (or feces) on wood surfaces. You should use caution to not cause permanent damage to your floor. 1. Clean up initially with paper towels. 2. In a bucket mix a solution of Murphy's Oil Soap and water. Using the solution clean the area thoroughly with a mop. 3. Dry with a cloth or paper towels thoroughly. 4. Spray an enzyme inhibitor (made especially to be used on wood surfaces) onto a dry rag and wipe the area. � The faster you clean up the mess, the easier it will be...and the less likely stains will set. � it is important to remember that you must eliminate all odor. Even if you cannot smell it, companion animals can, and they will likely try to pee on or mark over the same area. They do that out of instinct, not spite. Follow these clean-up steps for wet or dried urine spots. � Use nontoxic products that are specifically made for pet messes and pet odors. They are typically more effective, since they organically break down waste while neutralizing odors, and they are safer for homes with animals. But always check the label to be sure. � There are nontoxic, inexpensive cleaning solutions you can make at home using standard ingredients such as baking soda, white vinegar and club soda. 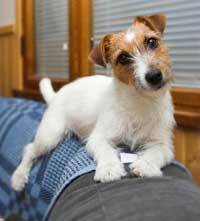 � Treat stains properly to avoid permanent damage to carpets and upholstery. You need to know how to clean dog urine, but you also need to know how to train your puppy to be housebroken. Training your dog to be housebroken is probably the most basic thing that must be taught to your dog if he is going to be a welcome and happy member of your household. � Crate or confine your dog in some way. � Get him on a schedule. � Chart his success and failures. � Control his access to food and water. � Walk him in the garden often and only for short periods of time. � Don't punish mistakes. � By following these simple steps you should have a dog that is making great progress in only four to six weeks. If you have serious problems with your puppy or if you acquired a older dog with existent and persistent housebreaking behavioral problems, you probably should seek professional help to see if there is some physical reason your pet is having so many problems.